Many overseas visitors have described Misty River as the best entry into South Africa and by local visitors as the gem in Johannesburg. Whether you are taking just a break from the city life, on a business trip or attending a wedding or conference we guarantee that you will feel revived and totally relaxed. Misty River is part of the original farm Eikenhof founded by the owners’ great grandfather Christiaan Ludolph Neethling in 1875. The Misty River farmhouse was built in 1919 and restored to it’s formal glory in 1997. The century old oak trees, with the large Klipriver berg mountain towering above form an ideal backdrop for any great event or party. 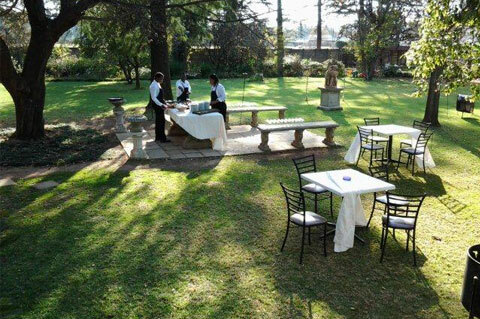 The garden is simply magnificent all year round and act as a fantasy introduction to any function such as weddings, birthdays, engagements and special celebrations. 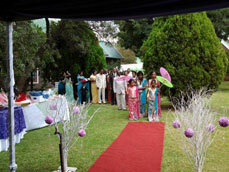 It is also ideally suited for corporate events such as conferences, launches and team building exercises. The animal farm on the property adds great atmosphere to any kiddies party with lots of open spaces to play. 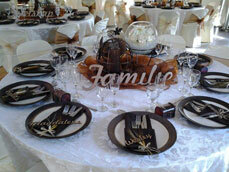 The lapa in turn is a great setting for intimate parties with it’s great bush veld ambiance. Misty River is located south of Johannesburg and our farm borders the Klipriver. 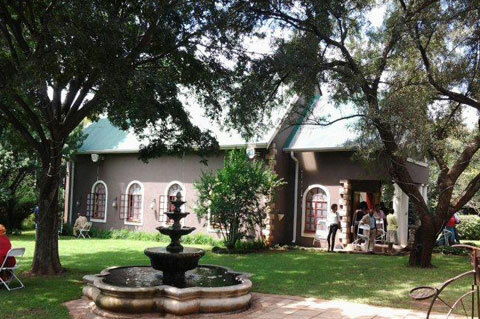 We also have a full library on site for reading, a herb garden with fountain for ultimate relaxation, the Klipriver within walking distance for hiking and birding and a swimming pool for hot summer days. Located 10 minutes from Nasrec Exhibition Center, 15 minutes from Soccer City where the 2009 Confederation Cup as well as the 2010 World Cup Finals will be hosted. We are 13 minutes from Gold Reef City Amusement Park and Apartheid museum. Horse riding, Spa treatments and tours to Gold Reef City and Soweto arranged on request.